law,judge software,advocate software,notaries software,helpers,notary,lawyers diary,worksheets,case facts,legal copposing parties and attorneys, case details, exhibits, documents, discovery, mail, e-mail, phone calls and much more. 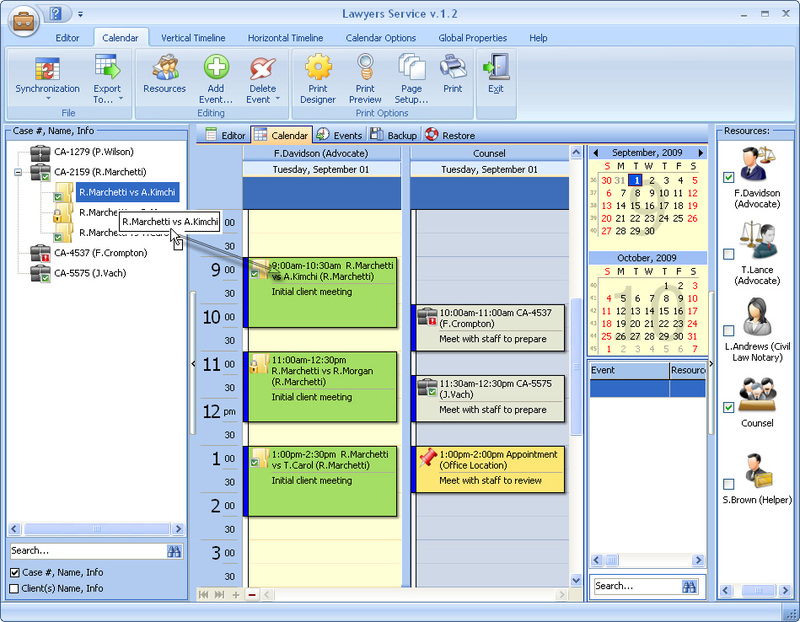 Lawyers Service combines powerful case management tools for organizing clients, case details, exhibits, documents, discovery, mail, e-mail, phone calls and much more. Lawyers Service is designed to help you effectively keep track of not only your schedule for a particular matter, but all the other associated details that will require your attention before you can easily bring that case to a successful conclusion. A comprehensive solution, the program allows creating the database and events planned. It is absolutely essential for lawyers as it provides them with a tool to organize the business and to manage it effectively. It's perfect for lawyers to plan working hours so that the cases do not overlap with someone else and potential scheduling conflicts with other cases are identified immediately and appropriate reminders are sent when needed. It'll store the information about clients, such as their address, info, personal notes, comments. Add as many comments as you wish, including pictures. The program gives you a customizable Date Navigator and comprehensive reminder. The software supports most of the formats, including HTML, which makes saving cases extremely easy. Just save it as is, drag and drop it directly into the appropriate time slot - and it is in the database! It's highly flexible, allows changing time intervals, creating numerous profiles and viewing multiple schedules at a time. For those people, who work in MS Outlook, it's possible to export data. Export of data is available to different formats: iCal, XLS, PDF, TXT, HTML, XML for its adaptation for other programs. When you need a printout of your schedule, you'll certainly appreciate the powerful Print Designer. It'll help you to print your schedule in the most convenient form, choosing from a number of templates. In case of crashes or virus attacks, there is an auto backup function with a possibility to remove old archives automatically. Powerful software to make your business more efficient! track of not only your schedule for a particular matter, but all the other associated details that will require your attention before you can easily bring that case to a successful conclusion.